There was a time when I had a single pram, a double pram and an umbrella stroller. Unfortunately one had to live permanently in the car boot, simply because I had run out of pram parking space in the house. 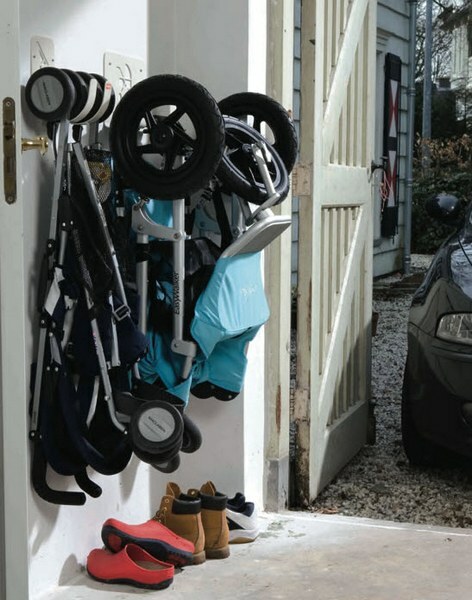 The BuggUp pram storage system gets your folded pram or stroller off the floor and onto the wall. Holding up to thirty-five kilograms, the Dutch-designed bracket system mounts to any wall – of course the BuggUp can be used indoors but the possibilities for garages and the back porch are pretty attractive. Equally, for those living in apartments or small houses, it’s the perfect solution for getting the pram out of the entrance way. BuggUp come in two sizes – the small model ($49.95) is for strollers and the larger model ($59.95) for prams. BuggUp is expected to hit stores soon. In the meantime, Babyology readers can buy direct from Half Pint Designs. Send them your order and Half Pint Designs will get back to you with payment details, with delivery via express post. We previously wrote about a similar concept, StrollAway, in 2008.